Personalized State Plates for your Scooter, Motorized Car, Electric Bike, Bicycle, Motorcycle, ATV, Motorized Vehicle, Laundry - Mail Cart, Walker, Wheel chair & More. Finally, a State Plate with Your Name, Your Spelling ! Great Party Favor for Children's Parties. Have other creative uses for bike plates? Let us know! Choose from the State List below. 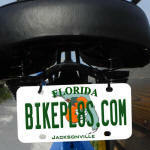 Our Bike Plates are made from aluminum,. We offer a variety of sizes 2x4, 2.25x4 (with and without frame), 2.5x4, 3x6, 4x7 and 6x12. We also have a plastic 4 hole option for 3x6 plates. Plates may have 2 top round holes or 4 slot holes (2 on top and 2 on bottom) for application. Plates are high gloss. All Plates are perfectly flat and Printed in full color. with no set up charges! 2 Zip ties are included in with your plates for application.